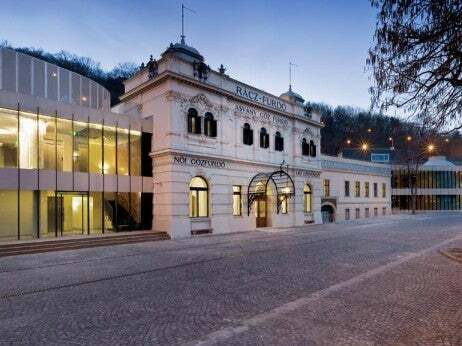 The Rácz Hotel & Thermal Spa is under construction and scheduled for opening towards the beginning of 2012. An oasis in the heart of the city, this hotel will include a five-star boutique venue with 67 spacious rooms and suites and is located next to the historic Rácz Spa, which is renowned for its 16th century Turkish bath and 19th century pools. This luxury thermal and day spa includes 13 pools in total, relaxation and sauna areas and 21 treatment rooms. A niche product unlike any of the existing five-star hotels in Budapest, the Rácz Hotel will offer a blend of modernity and history from its beautiful park location. Why we love it: With its circular shape and large private terrace, the Royal Suite will exude an atmosphere of warmth, opulence and modernity to complement the splendid panoramic views of the Royal Palace, the historic Rácz Spa, Buda Park and the Elizabeth Bridge. Located on the fourth floor of the hotel, the Royal Suite will be accessible by a private elevator and will include a living room, two bedrooms with king-size beds, and bathrooms with private saunas and marble bathtubs.